"The Photo Man" is a short documentary featurette detailing the livelihood of Mark Kologi, a found photo collector and salesman. Over the years, Mark estimates that he has collected and sold millions of forgotten personal photos of strangers to strangers. 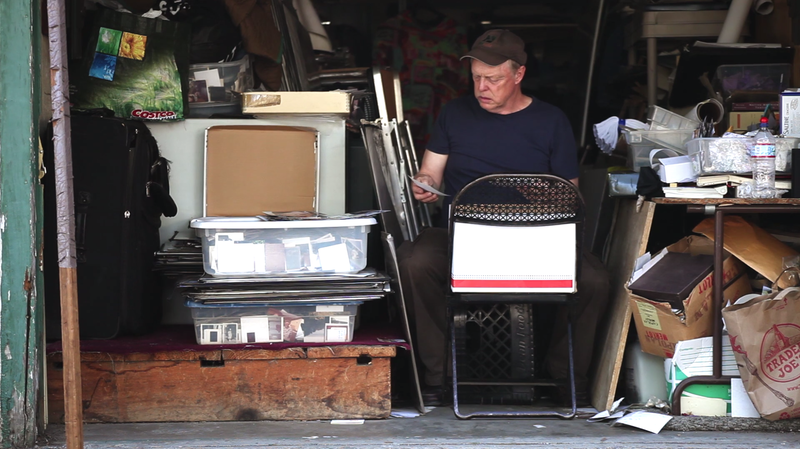 The video, directed by Ben Kitnick, follows Mark from his photo-storage garage to the Los Angeles open air markets where he sets up shop, all the while waxing poetic on his chosen career and the beauty he sees in old photos. "When people are standing all around these buckets together, there's this common experience that is very individual and private, but yet, because we all have it, we're sharing an emotional bond even with all these strangers," says Mark "and I think that's why people come back time and time again." "As I look back on them all, it's this tide of humanity that's just flooded my life and then into [these other] lives and dispersed into these little tributaries and all these homes and albums and all these places, so its really that that I really take away from the experience."